With a rich history of milestones and challenges, the Detroit Waldorf School celebrates 50 years as a unique, community-driven institution — and with record enrollment to boot. If you could peek into a classroom at any point in the Detroit Waldorf School’s 50-year history, things would look remarkably similar. 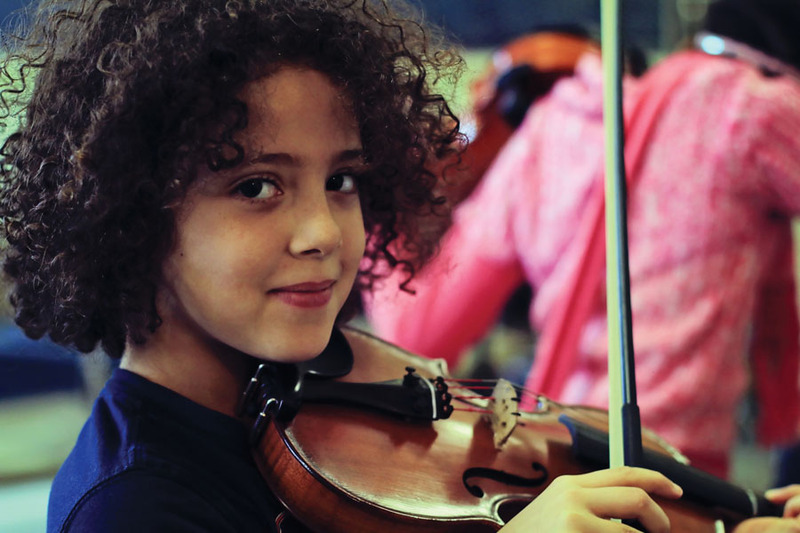 You’d see first-graders learning to cook, second-graders learning to knit, third-graders picking up the violin, and students throughout the school’s pre-K through eighth-grade classes practicing eurhythmy (expressive moment). And even now, when over half of DWS’ 230 students are too young to know a world without the iPhone, you still wouldn’t see a single one checking messages between classes. But what’s most remarkable about the Detroit Waldorf School isn’t that it’s endured despite its adherence to its “developmentally appropriate” approach to education, but because of it. Founded by German philosopher and scientist Rudolf Steiner in 1919, Waldorf education strives to “bring forth the gifts that all children possess” through a curriculum that integrates the arts into the academics. Students are encouraged to learn at their own pace and teachers typically remain with a class as it progresses through the grades. In lieu of traditional textbooks, grading systems, standardized tests, or computers, the educational philosophy relies on creativity, imaginative play, and independence to help each child reach his or her full potential. The unique educational approach was introduced to Detroit in the 1960s by Detroit physician Rudolf Wilhelm and his wife, Amelia. The German immigrant couple had long been interested in establishing a Waldorf school in the city, and in 1966, just a year before the ’67 riots/rebellion, DWS opened as one of the city’s first private, racially integrated schools. Originally, the school was located in the basement of a Methodist church, but later moved into its current building in Indian Village, a former Liggett girls’ school designed in 1913 by Albert Kahn. Last September, a commemorative marker designating DWS as a Michigan Historic Site was erected on the school’s lawn. Today, DWS is one of over 150 Waldorf schools in the U.S., and one of two in Michigan (the other is in Ann Arbor). Though the school has indeed remained open for five decades, its existence hasn’t always been secure. In the ’70s, a disagreement inspired some parents to form a breakaway school. In the ’80s, DWS’ high school closed. And in the late ’80s and early ’90s, relocation was on the table. In 2008, when the recession hit, the school’s enrollment dipped tremendously. Dissolution seemed imminent, but again, DWS found a way to keep its doors open. More recently, DWS has been flourishing. Within the past five years, the school has nearly doubled its enrollment from around 120 students to 230. Faculty members attribute the growth to multiple factors including a more structured marketing campaign and its ability to adapt to a changing Detroit. Parents in and around Detroit have been sending their children to DWS for decades, but as Detroit Public Schools continue to grapple with mismanagement, budgetary issues, and a general lack of resources, parents living in the city proper continue to seek alternatives to DPS beyond both charter and parochial schools. New Center resident Sandi Heaselgrave says she and her husband were also looking for a local school with a more alternative approach to education. Heaselgrave’s son is now a first-grader at DWS. “We were looking for a very diverse student body, and we were also looking for somewhat of a more natural learning process than the new standardized testing education systems,” Heaselgrave says. Of course, private education comes at a cost. Annual DWS tuition ranges from just under $10,000 for five full days of pre-K to around $13,300 for third through eighth grades. There are reduced rates if a family enrolls more than one child at the school. As students develop a network of support among each other, parents and teachers often do, too. Myra Anderson, mother of Detroit-born rapper Big Sean (Sean Anderson), who graduated from DWS in ’02, says she remembers how supportive the parent-teacher community at DWS could be. To this day, the Andersons stay in touch with Sean’s kindergarten teacher, Ms. Beth. “She came to his concert when he was in Seattle the year before last,” Anderson says. But most of all, Anderson believes Sean’s experience at DWS contributed to his becoming a creative and compassionate person. In the end, every school hopes to lay a great foundation for its students. And although DWS has succeeded so far in building a strong, 50-year-old foundation of its own, it continues to strive for improvement — like any good teacher does.